An easy peasy way to make your mail stand out is to use unique stamps. No more of those Canada flags, or the Queen, or even beautiful Canadian landscapes. As much as I enjoy these things, everyone’s mail looks like that. I’m all for adding whimsy to everyday mundane things (like mail!) and making them not-so-mundane. In an electronic age, send personal mail that is an absolute treat. I love to dress up my mail using unique stamps to make it extra special! Consider using one of these three options of unique stamps when sending out your wedding invitations, birthday cards, or just because. Vintage stamps are trendy now, especially on wedding invitations. It really adds a touch of elegance to the envelope. If you are looking for vintage stamps, make sure to look for unused vintage stamps! Used stamps will look nice in your collection, but will be of no use if they’ve already been cancelled (meaning the stamps has already gone through the mail). You can find unused Canadian vintage stamps on eBay, Amazon, and Etsy. My favourite place to get vintage stamps is from Jaime at Send More Mail. She’s the absolute sweetest to work with, and even groups stamps in little packs that add up to 85 cents – the current postage rate! Using personalized stamps is ideal for wedding invitations, baby announcements, and family Christmas cards! You can upload your favourite photo to Canada Post and make a stamp that is completely unique to you. If you own a small business, it’s also not a bad idea to brand your mail using branded stamps, too. You can create a stamp with your logo, or an image with your branded colours, and make sure that each item that leaves your hands is 100% branded, including your postage stamps. 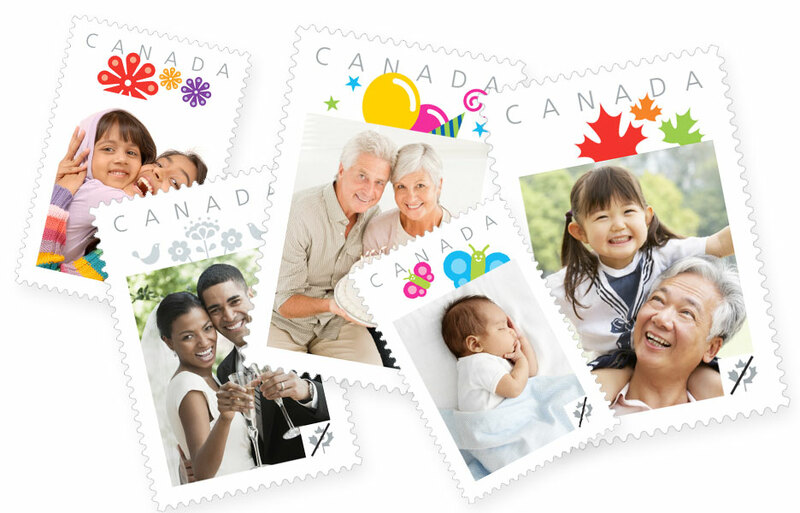 Mix and match some of Canada Post’s regular stamps! If you’re mailing something that qualifies as oversized lettermail (like if your wedding invitations are a little on the heavy side with all those extra details in the envelope), you have the perfect excuse to use two different permanent value stamps and one 10c stamp (85c + 85c + 10c = $1.80). What’s your favourite way to use stamps? P.S. This post is from a Canadian perspective, but the same ideas apply no matter where you live. Just look up the postal service in your country to see if they offer vintage or custom stamps! P.P.S. April is letter and card writing month! A perfect excuse to use some unique stamps and send snail mail to someone you care about. This is such a great idea! I love when letters arrive with fun stamps! Thanks Mylah! I agree – they make them so much more exciting to receive! I am so excited to check out the Send More Mail store! I absolutely LOVE fun stamps! They add so much to wedding invitations especially. Yay! I agree. Fun stamps great for any day, but weddings especially! What a fun idea! I am going to have to try this! I absolutely love this! I am going to start following your blog on bloglovin’! I love when people incorporate fun stamps- especially vintage ones!